I used to cook everyday for a living. I cooked for hungry school children and teachers. I cooked for a busy, young family, and often I’d come home and cook for Sam and me. I used to think that it would be living my dream – to cook all the time and make people happy with the food that I cooked, but I discovered in the last few years that sometimes dreams change once you begin to live them. And sometimes life just takes you in different directions. For me, I get satisfaction from turning seemingly basic foods into comforting and delicious meals. I like the feel of breaking cold butter into flour, blending the ingredients just enough so they become semi-homogeneous, and rolling out cold dough to lay gently into a pan as if laying a baby down to sleep. I really do enjoy making a homemade pie crust. I love the sensory parts of cooking – touching cake to feel for that spring of doneness, bending my nose over a pot of simmering soup to smell its seasoning, and listening to the crunch and crack of chopping nuts with a sharp knife. Cooking loses its intrigue when it becomes repetitive, mandatory, and no longer creative. Sometimes cooking for a living can do that, especially when you’re cooking to particular customer preference. Those of you who have been following me for a while know that my body has been telling me it doesn’t like the way I eat anymore and while I’ve been trying to listen to what it wants me to eat, I’m having a hard time understanding. Preparing mouth-watering foods for others that I myself can’t eat (or am afraid to eat for fear of not feeling well) has worn on me and so I’d rather not be around food all day every day. Working in food sometimes means obsessing about food – thinking about what your next meal will be, what you will cook later, and creative new recipes you want to try. Sometimes my obsession with food drove me crazy and I felt it hard to release myself from thinking about it. Stocking the fridge with delicious foods for the week ahead – snacks, meals, cookies. Using up ingredients and leftovers just in time to restock and replenish. Making something out of seemingly nothing. I started a new job about a month ago (hence part of the reason I’ve been absent here) and it is so very different from my previous food jobs that it has been a bit of an adjustment. Instead of deciding what to eat from the myriad choices of the school cafeteria, I have to pack my lunch ahead of time and hope I’m still in the mood for that food by lunch time. Bustling around a hot stove and oven have been replaced with staring at two large computer monitors while furiously trying to find the information I need to answer the question at hand. I look forward to fresh air lunch time walks and to the end of the work day. It has been a big change, but I’m hoping it will lead to something greater. 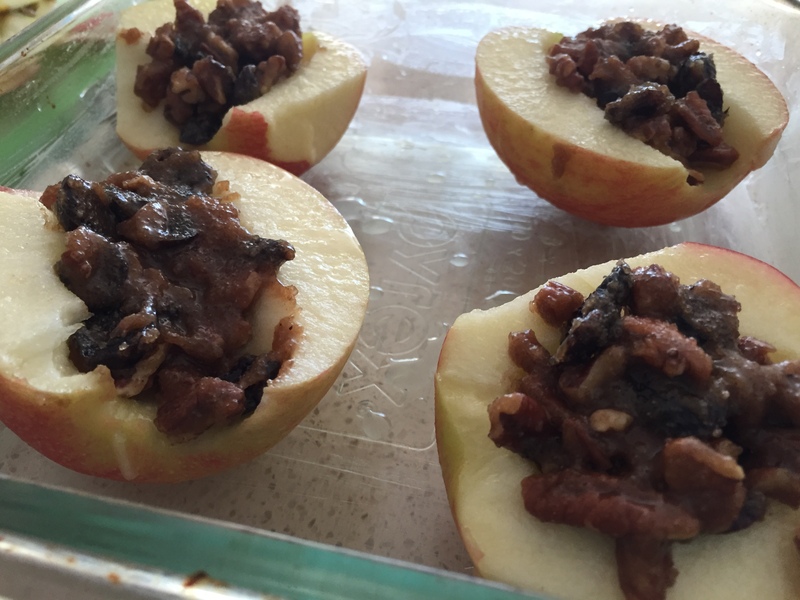 Now for a simple recipe to end this long train of thought: Baked Apples. I invited some friends over for brunch yesterday without really considering what I had in my fridge to feed them. 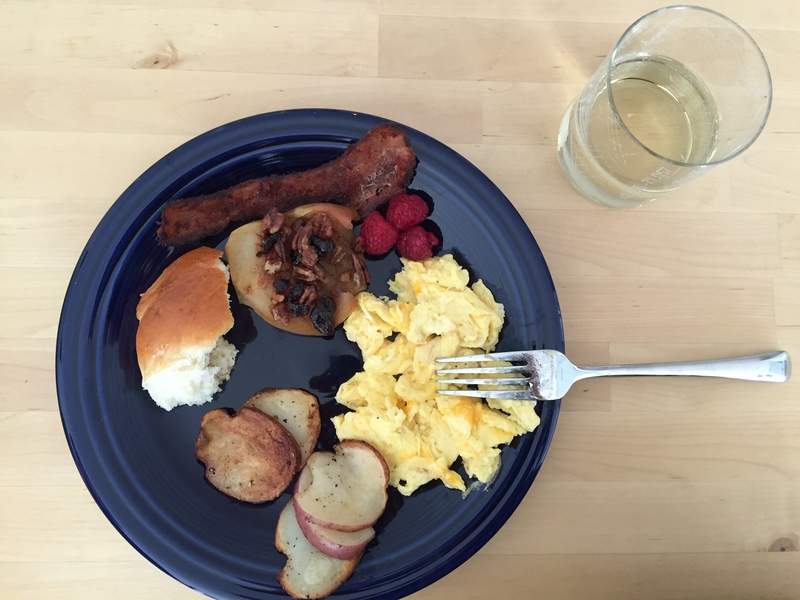 Despite the lack of planning, with a few items picked up from the store and a little creativity we had a delicious brunch. 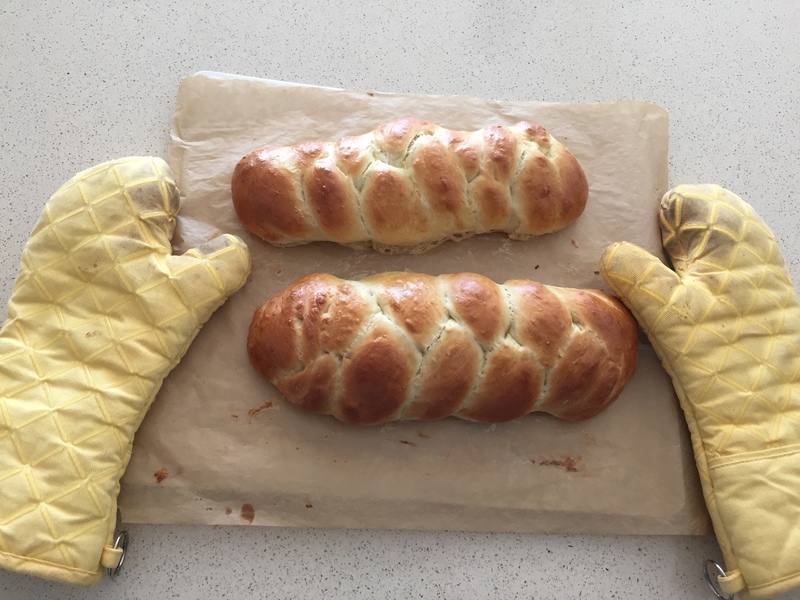 I baked homemade challah bread and stuffed some apples we had in the fridge with a delicious amalgamation from what I had on hand. And the results: divine. Now this is the kind of cooking I can enjoy! This recipe can be easily scaled up and toyed around with. The below amounts are approximations of what I used. Preheat the oven to 350. Lightly butter an 8×8 square pan or other pan that will fit your amount of apples. Cut the apples in half. Using a melon baller or small spoon gently remove the seeds and core so you get a shallow canal in the middle of each apple half. Squeeze your lemon half over the apples and lightly rub them to make sure they are well covered. Mix your sugar, butter, salt, cinnamon and ginger in a small bowl. Stir in pecans and cranberries. Taste and adjust as desired. 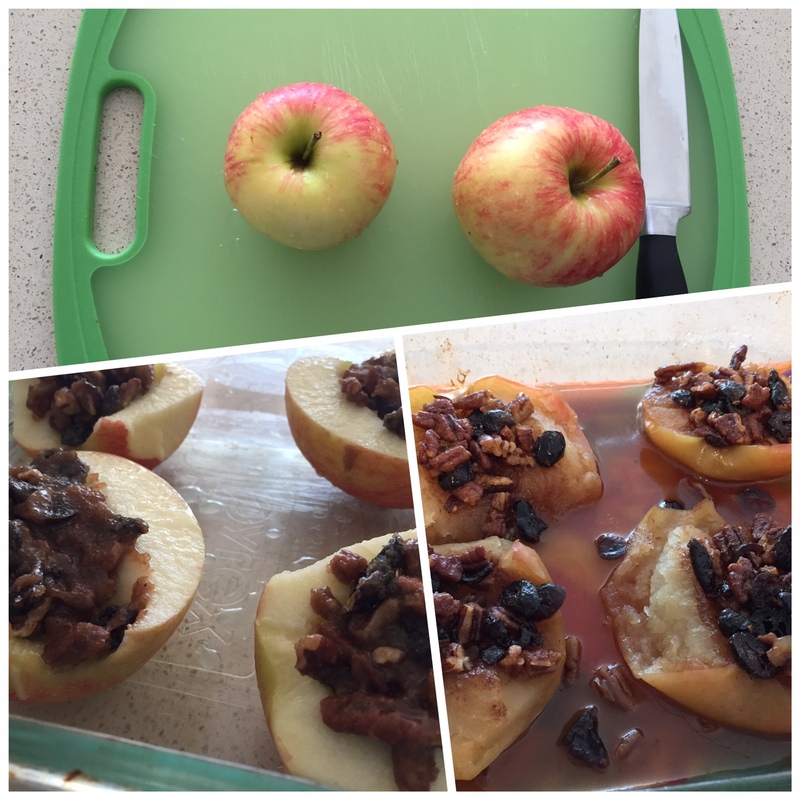 Divide mixture between your four apples halves and place in prepared pan. Cover in foil and baked until your desired tenderness 30-45 minutes. Serve warm with brunch or as a dessert with vanilla ice cream.